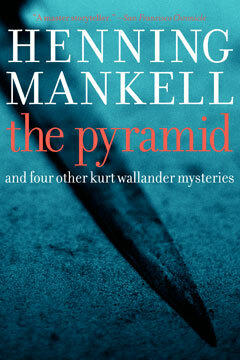 The Pyramid is the long-awaited addition to Henning Mankell’s critically celebrated and internationally bestselling Kurt Wallander mystery series: a book of five short mysteries that takes us back to the beginning. Here are the stories that trace, chronologically, Wallander’s growth from a rookie cop into a young father and then a middle-aged divorcé, illuminating how he became a first-rate detective and highlighting new facets of a now-canonical character. “Wallander’s First Case“ introduces us to the twenty-one-year-old patrolman on his first homicide case: his next-door neighbor, seemingly dead by his own hand. Wallander is a young father confronting an unexpected threat on Christmas Eve in “The Man with the Mask.” In “The Man on the Beach,” he is on the brink of middle age and troubled by a distant wife as he unravels why a lonely man on vacation was poisoned. Newly separated in “The Death of the Photographer,” Wallander investigates the brutal murder—and the well-concealed secrets—of the local studio photographer. In the title story, he is a veteran detective uncovering unexpected connections between a downed mystery plane and the assassination of a pair of elderly sisters. Over the course of these five stories, he comes into his own as a murder detective, defined by his simultaneously methodical and instinctive work, even as he finds himself increasingly haunted from witnessing the worst aspects of an atomized society. Written from the unique perspective of an author looking back upon his own creation to discover his origins, these mysteries are vintage Mankell and essential reading for all Wallander fans. The Pyramid is a wonderful display of Mankell’s virtuosic powers as an acknowledged master of the police procedural.